Hello, fearless friends. Welcome back to the weekend, especially if you’re in part of the country that was slammed with snow this week. You know, like Texas. I kid, I kid. Anyway! It’s time for another edition of the Weekend Coffee Links. By now you know how this works. I show you mine and then you show me yours. Going corporate and miss the rat race…ain’t so bad: Sometimes it’s worth it to remove yourself from the daily hustle so that you can spend more time where it matters. Like with your family. And your kids. And probably a dog somewhere. The Mac Inventor’s Gift Before Dying: The gift is rarely the thing that’s wrapped. How to cope with your life as a social media celebrity: Whether you have 50 followers or 50,000, this is a great essay on the detachment that often goes along with social media. It has nothing to do with ego, it’s about protecting your real self. Why bacon is a gateway drug for vegetarians: More proof that bacon is evil and why I don’t eat it. I know, I know, I’m not from this world. Polar bear swims 9 days in search of ice: A polar bear swam continuously for nine days in an attempt to find sea ice. 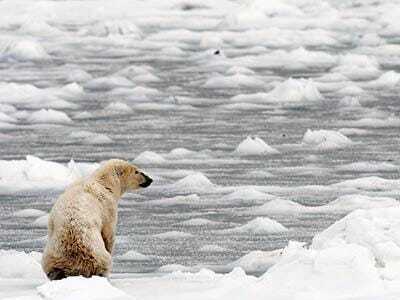 Polar bears are being forced to swim longer and longer distances at the expense of their health because of climate changes. Sad. Walgreens to sell their own brand of beer: Oh goodie! Beer you can buy at the drug store for $.50 a can. That’s what America needs. Best 2011 Super Bowl Commercial: Yes, I know the Super Bowl hasn’t even happened yet (it’s tomorrow, right? Right? ), but Volkswagen was smart and released its commercials early. The Force? The cutest thing ever. Love. Love Love. I want to snuggle him. If Filmmakers Directed The Super Bowl: This is about as much of the Super Bowl as I’m going to watch but…it’s awesome. He wants to dance with somebody: So do I. And it’s *that* guy. OMG, and the lady with the flame! Those are my finds for the week. Your turn. And happy Super Bowl to you, whoever you’re cheering for. This post originally appeared at Outspoken Media.